PHQ Cards are postcards issued by the British Post Office depicting the designs of theircommemorative stamps. 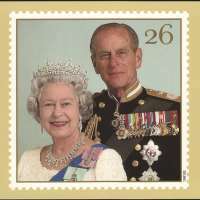 They are generally available to buy in main post offices about two weeks prior to the release of each new set of stamps. The 'PHQ' stands for Postal Headquarters. All items published by the Post Office are given a number which is prefixed by letters. 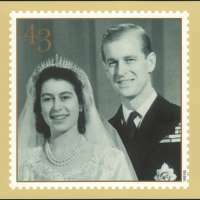 Elizabeth and Philip were married on 20 November 1947 at Westminster Abbey. They received 2500 wedding gifts from around the world. Because Britain had not yet completely recovered from the devastation of the war, Elizabeth requiredration coupons to buy the material for her gown, which was designed by Norman Hartnell. 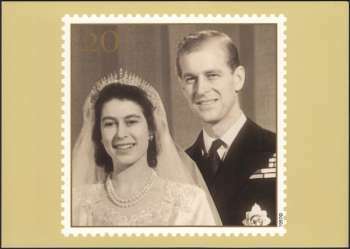 In post-war Britain, it was not acceptable for the Duke of Edinburgh's German relations, including his three surviving sisters, to be invited to the wedding. The Duke of Windsor, formerly King Edward VIII, was not invited either.